Usually I cook the pasta in boiling water... add it to sauce in the pan, another 2-3 minuts and done. 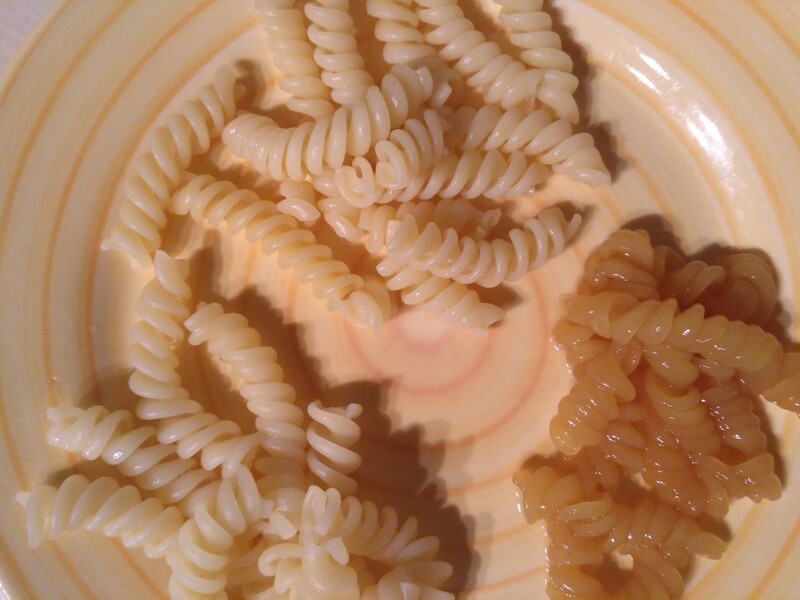 But today I've tried to cook pasta in the sauce. Sauce: pepper + onion + garlic + flour + tomatoes + wine. I've added a little bit water + Raw spaghetti. They were cooking, covered by the water (sauce). And if usually they done afer 10-12 minutes, at this time it took 20+ minutes. It's because sauce was acidic? Is there reason to add a little bit acid to the water, where spaghetti usually are cooking? To prevent them from being overcooked. No, it has nothing to do with the acidity of your sauce. It took a lot longer to cook because of the prevalent temperature throughout the pan, and the mass of the material being heated. Sauce + Noodles is a lot to heat up, a lot more than just a pot of water. It's also unlikely you fully boiled the Sauce + Noodles as you would have with water (to a full rolling boil). If you had left it cook long enough on high heat, eventually the noodles would get overdone and soggy, and if left even longer, the sauce and noodles would burn too. Probably worth noting: by cooking the raw pasta in the sauce, you're adding a lot of starch directly to the sauce, probably making it quite a bit thicker than normal. This may or may-not be good, depending on your preferences. I expected it to be the same for pasta, and since I had a handful of leftover Barilla n.34 occupying space in my cupboard I simply cooked up two batches. Both were cooked in boiling water for the recommended 6 minutes in a glass of water without salt. Rinsing them off with clean water mostly got rid of the acidic/alkaline taste (except some droplets that were remaining in deep crevices. I guess using something less squiggly, like spaghetti one could rince off the vinegar completely) I was checking the taste and consistency throughout writing this post. Ignoring the remains of vinegar/soda, there were no percievable difference between those two. The baking powder, in addition to Sodium bicarbonate, has an acidic counterpart Disodium pyrophosphate which means that even with a full tablespoon of it, the pH didnt change much. So I brought out the big guns and boiled some of the cooked pasta with a teaspoon of drain cleaner for one more minute. They attained a darker colour and the water also turned yellowish. I did not taste-test those, but they were, and 20 minutes later still are, very glossy sticky and mushy. I left them on the table overnight, and while the first two batches started drying out around the edges and became stiffer, the drain cleaner pasta is still soft, sticky and glossy. This experiment could be improved by using spaghetti, since they are more uniform, and measure their curvature radius and mass as an indicator of how al-dente the are and how much water they absorbed. I think it is because your ingredients are not up to 212 F. I takes them a while to cook up to 212 F. The water may be boiling but a lot of the pasta is touching the ingredients. Not the answer you're looking for? Browse other questions tagged pasta acidity spaghetti acid or ask your own question. How do I use this store-made tomato paste with pasta?